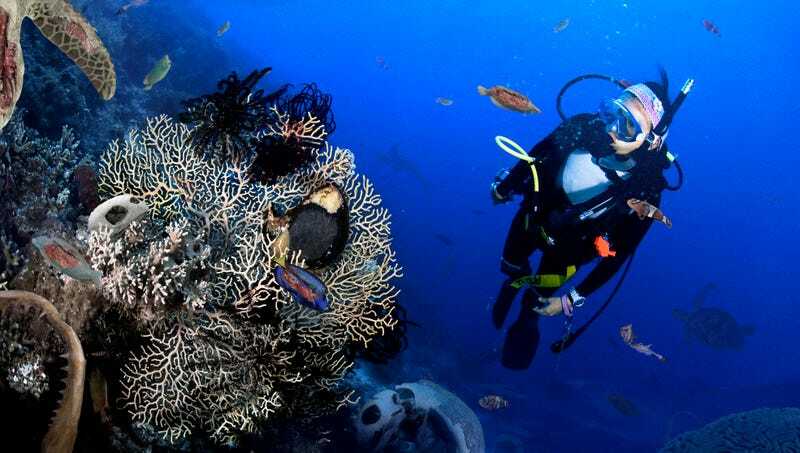 CAIRNS, AUSTRALIA—Adapting to the climatic changes that have irrevocably altered the world’s largest once-living thing, tour guides on Australia’s Great Barrier Reef are now offering divers a chance to see the breathtaking diversity of ocean death. “Whether you want to see thousands of colorful crabs that died as a result of increasing ocean acidification or check out the abandoned, algae-covered remnants of what used to be a thriving parrotfish colony, the Great Barrier Reef presents visitors with a unique opportunity to take in a whole spectrum of dead and dying marine life,” said Charlie Mande of Great Barrier Reef Dive Expeditions, a company offering divers a close-up look at dead organisms from clouds of lifeless starfish no bigger than dimes all the way up to full-on whale shark carcasses. “The Great Barrier Reef is actually the world’s largest coral reef system, and since it’s all completely dead now, we have the unique opportunity to see mile after mile of bleached, stark-white coral hosting the remains of an entire ecosystem—dead mollusks, decaying worms, husks of sponges, all drifting across the barren ocean floor thanks to rising sea temperatures and high concentrations of nitrates. You might also catch a glimpse of a turtle slowly suffocating to death after accidentally ingesting a plastic bag.” Mande added that within the next five to 10 years, the massive die-off of oceanic food sources would allow Great Barrier Reef Dive Expeditions to offer the sight of huge rafts of dead humans.